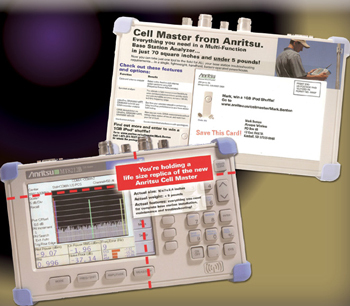 Anritsu provides test equipment to cellular providers, that is used by technicians who have to climb towers to test cell signals. As you can imagine, bulky and heavy equipment is a deficit when scaling high towers and rooftops. When Anritsu announced a new product, the Cell Master, it was the smallest and lightest product available for these “tower dogs.” We needed to show the Cell Master’s small size, and we did so by making a dimensional direct mail die cut to the exact size and shape of the new Cell Master to demonstrate how they won’t need a backpack or anything to carry this equipment. We followed up with an email and tele-prospecting campaign to schedule demo appointments. Do you want targeted potential clients to schedule demo appointments? Our lead generation team did it for Anritsu. Call and speak with one of our experts now.